Cover crops are sometimes referred to as "green manure." They are natural methods utilized by those practicing sustainable agriculture to improve soil quality and productivity. 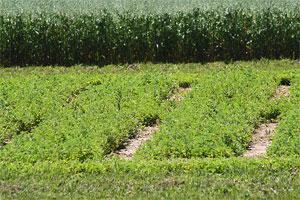 Most often, leguminous crops are used because they have the ability to fix nitrogen in the soil. They do this in a curious way that involves converting nitrogen gases (in the air) to minerals (in the soil). Those favoring this method do so because the environmental impact is positive as compared to industrial methods for adding nitrogen to the soil that rely on fossil fuels and have the undesirable effect of depleting oxygen in the water. Leguminous plants are unique because they all produce seed pods, like peas and beans, but fenugreek and lupins are also legumes. 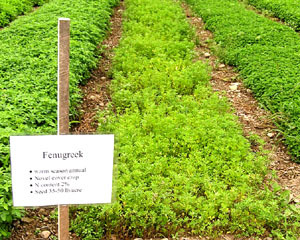 Fenugreek is one plant often used as a cover crop as well as a substitute for alfalfa. It is a fast-growing legume that reaches about 2 ft. in height (60 cm) and as its botanical name, Trigonella foenum-graecum, suggests, it is often used as a hay substitute. It is favored by those who wish to promote milk production in dairy animals or improve the sheen of feathers and fur. Fenugreek is an annual and is only cut once a season but it produces more than alfalfa and is frost tolerant when planted early.